Summer is the season for love and affairs. I plan to have as many affairs as I can. Of course, I mean “art affairs” because good art demonstrates Tolstoy’s Theory of Art. In films, paintings and writing, art relationships convey emotion and bridge the distance between the artist and the art recipient. Film is an easy art form to love. The final production represents the vision of screenplay writer, director, cinematographer, actors, soundtrack composer and hundreds of other technical experts. In Writing Screenplays That Sell, Michael Hauge writes that a winning screenplay “enables a sympathetic character to overcome a series of increasingly difficult, seemingly insurmountable obstacles to achieve a compelling desire.” Empathy engages the audience to experience a characters’ emotions. Each of these movies—Moonlight, Manchester by the Sea, and La La Land—conveys emotions and establishes relationship. According to Tolstoy, all art forms offer this relationship experience, an opportunity to share a connection. My favorite art affairs are with paintings and sculptures I have seen many times and for many years. Travel to San Antonio, Texas requires visiting my childhood friends including Chagall’s “Dream Village” and Diego Rivera’s “Delfina Flores” at the McNay Art Museum. The Art Institute of Chicago houses other long lost friends and family, mostly in the 20th and 21st century rooms. Each visit discovers new subtleties missed before and possible new meanings in the twinkle of an eye or the last glint of a setting sun. The same changing relationship occurs with literary classics. I will reread a piece, such as Arthur Miller’s Death of a Salesman, and find aspects of the theme and plot more meaningful as an adult than as a high school student. A teenager might sympathize with the Happy, Biff or Bernard. The adult reader is more likely to fear and dread the consequences of Willy Loman’s mistakes. Good writing forms a quick connection with different types of readers that spans hundreds of pages. When the last page of the novel is turned, there is an immediate sense of loss, an aimlessness, a disconnect that sends the reader to the bookshelf for the next story in the series or more of the same magic from the same writer. My son’s Humanities class ventured to the art museum to select a painting to form a relationship. He chose Pablo Picasso’s “The Old Guitarist.” The somber grayed blues of the contorted musician with head bowed and legs crossed are representative of Picasso’s Blue Period. The emotional painting illustrates Tolstoy’s Theory of Art passing along the painter’s sadness to the viewer. My college English class did a similar assignment, and I became a fan of Marsden Hartley. Decades later, I found the same painting now housed at the Amon Carter Museum of American Art in Fort Worth, Texas. It was like two old acquaintances meeting by chance. I almost said, “We know each other from somewhere. Don’t we?” I shared an emotional connection with the artist because he reminded me of my childhood in the Southwest. Tolstoy also believes art is a bridge across time and culture. The Death of Ivan Ilyich is a bridge to a different time, culture and country. Tolstoy, like other great writers, eliminates the distance that separates reader from author. What does it take to write like Tolstoy and how long? If an Olympic sport takes at least 10,000 hours for mastery, can an ordinary person transform into Tolstoy in five years. 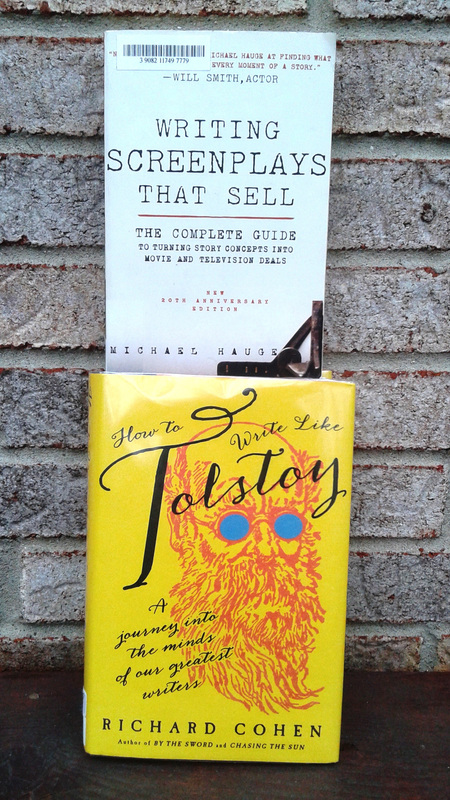 To speed my progress, I consulted How to Write Like Tolstoy by Richard Cohen. A Tolstoy example dominates the preface, but the book by this English professor is mostly about other great writers with a little Tolstoy sprinkled on top. Who writes like Tolstoy today? Who makes a reader care about make-believe characters enough to forget the time, neglect friendships and tasks waiting for attention? Some of my favorite writers are Elizabeth Stroud, John Updike, Junot Diaz, Yann Martel, Jim Harrison, Elmore Leonard, Lauren Groff and Cormac Mccarthy. A Tolstoy writer brings characters to life. Some I wish I knew, but most, I’m glad I only experienced through a story. Karen, as always I’ve learned something from your blog. Well done. By the time I reached the second sentence, I was beginning to think we’d have lots to talk about at our next crit group meeting. Thanks for playing along. I’m surprised the spouse remained silent about that line, but he knows me too well. Thanks Greg. It was fun to reflect on my past loves.